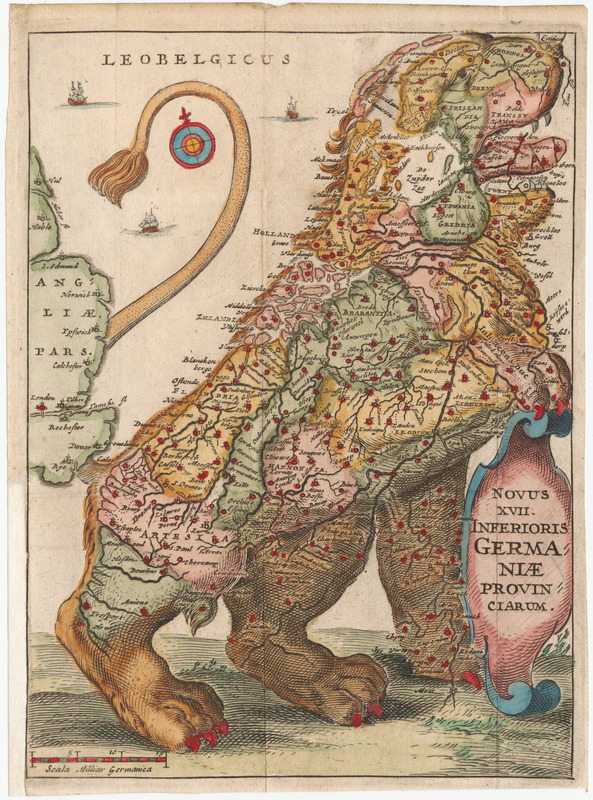 The Leo Belgicus map was "an important element in building a common sense of national belonging, in the birth – without wanting to exaggerate – of a Dutch identity, forged in the anti-imperial struggle." Ricci 2015, 117. The first Leo Belgicus map was made by Michael Eitzinger in 1583, during the Dutch War of Independence (1568–1648), a revolution by the "seventeen provinces" (predominantly, current Netherlands, Belgium, Luxembourg, and northern France) against Spain' Delaney 2012, 199. (For a discussion of "why a lion," see Heijden 2006, 11-22.) When the Dutch Republic was finally established in 1648, the cartographic image took on new meaning as a symbol of power and independence. Leo Belgicus was used as a logo on certain Belgian publications after the defeat of Napoleon (ID # 1037, Journal de la Belgique, 1815), and lions feature prominently on the nation's coat of arms today. Heijden identifies 33 separate versions of Leo Belgicus from 1583 to 1815, many with multiple states. This version is Hiejden 12.1, the title page from the 1648 edition of Famiano Strada's "De Bello Belgico". See also Baynton-Williams 2015, 30, 36, 38; Phaidon 2015, 263. Strada, Famiano, De Bello Belgico, 1648.